The eco-friendly Klarstein Bellevin wine cooler is a climatized residence for up to 16 bottles of your best wine. Indulgence all along the line. Equipped with six removable metal drawers, the wine cooler offers 1.6 cft volumetric capacity and space for up to 16 bottles of different types of grape juice. Through the glass window front, the upper row can be inspected directly from the outside and without further opening. Just like that, you can always keep an eye on your personal selection of wines. The cooling temperature can be regulated between 46 and 65 ° F, which means that the ideal drinking temperature for each type of wine can be reached. Two independent cooling zones allow for the appropriate treatment of two different wine lots. The Bellevin Beverage Cooler is controlled by a touch-sensitive touch panel including a LCD display which shows the set temperature. In addition to the temperature, the upper LED interior lighting can also be switched on and off via the control panel. Due to the elegant glass front, this lighting is not only visible when the door is open, but also puts the contained grape juices in an excellent light. Exquisite bottles. The elegant design is in perfect harmony with a genuine understanding of a tasteful interior decoration. Thanks to the high presentation factor, it is even ideal for a placement in the bar areas of hotels and gastronomic establishments. 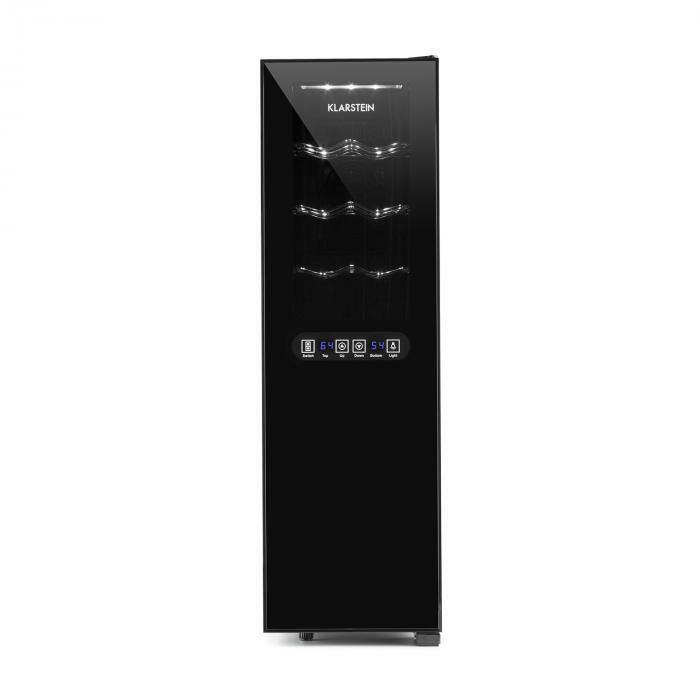 With the Klarstein Bellevin wine climate cabinet (also known as wine temperature cabinet) you get the ideal combination of storage and cooling. The wine climate cabinet ensures thus that you can serve the perfect wine for every occasion. Cheers! This device is exclusively designed for the storage of wine.